Council Regulation (EEC) No 3821/85 (3) lays down provisions concerning the construction, installation, use and testing of tachographs. It has been substantially amended on several occasions. In order to ensure greater clarity, its main provisions should therefore be simplified and re-structured. Experience has shown that, in order to ensure the effectiveness and efficiency of the tachograph system, certain technical elements and control procedures should be improved. Certain vehicles are subject to an exemption from the provisions of Regulation (EC) No 561/2006 of the European Parliament and of the Council (4). In order to ensure coherence, it should also be possible to exempt such vehicles from the scope of this Regulation. Tachographs should be installed in vehicles to which Regulation (EC) No 561/2006 applies. Certain vehicles should be excluded from the scope of that Regulation in order to introduce some flexibility, namely vehicles with a maximum permissible mass not exceeding 7,5 tonnes used for carrying materials, equipment or machinery for the driver’s use in the course of his work, and which are used only within a 100 km radius from the base of the undertaking, on condition that driving such vehicles does not constitute the driver’s main activity. In order to ensure coherence between the relevant exemptions set out in Regulation (EC) No 561/2006, and to reduce the administrative burden on transport undertakings whilst respecting the objectives of that Regulation, certain maximum permissible distances set out in those exemptions should be revised. The Commission will consider extending the period of validity of the adaptor for M1 and N1 vehicles until 2015 and give further consideration to a long-term solution for M1 and N1 vehicles before 2015. The Commission should consider the inclusion of weight sensors in heavy goods vehicles and should assess the potential for weight sensors to contribute to improved compliance with road transport legislation. The use of tachographs connected to a global navigation satellite system is an appropriate and cost-efficient means of recording automatically the position of a vehicle at certain points during the daily working period in order to support control officers during controls, and should therefore be provided for. In its judgment in Case C-394/92 Michielsen and Geybels Transport Service (5), the Court of Justice provided a definition of the term ‘daily working period’, and the control authorities should read the provisions of this Regulation in the light of that definition. The ‘daily working period’ commences at the time when the driver switches on the tachograph following a weekly or daily rest period, or, if the daily rest is divided into separate periods, following a rest period of at least nine hours’ duration. It ends at the beginning of a daily rest period or, if the daily rest is divided into separate periods, at the beginning of a rest period extending over a minimum of nine consecutive hours. Directive 2006/22/EC of the European Parliament and of the Council (6) requires Member States to carry out a minimum number of checks at the roadside. Remote communication between the tachograph and control authorities for roadside control purposes facilitates targeted roadside checks, making it possible to reduce the administrative burden created by random checks on transport undertakings, and should therefore be provided for. Intelligent transport systems (ITS) can help to meet the challenges faced by the European transport policy, such as increasing road transport volumes and congestion, and rising energy consumption. Standardised interfaces should therefore be provided in tachographs in order to ensure their interoperability with ITS applications. Priority should be given to the development of applications which help drivers to interpret the data recorded in the tachograph in order to enable them to comply with social legislation. The security of the tachograph and its system is essential to ensure that trustworthy data is produced. Manufacturers should therefore design, test and continuously review the tachograph throughout its life cycle in order to prevent, detect and mitigate security vulnerabilities. Field tests of a tachograph that has not yet been type-approved allow equipment to be tested in real-life situations before it is widely introduced, thereby allowing faster improvements. Field tests should therefore be permitted, on condition that participation in such tests and compliance with Regulation (EC) No 561/2006 is effectively monitored and controlled. Given the importance of maintaining the highest possible security level, security certificates should be issued by a certification body recognised by the Management Committee within the framework of the ‘Mutual Recognition Agreement of Information Technology Security Evaluation Certificates’ of the Senior Officials Group on Information Systems Security (SOG-IS). In the context of international relations with third countries, the Commission should not recognise any certification body for the purposes of this Regulation unless that body provides equivalent conditions of security evaluation as envisaged by the Mutual Recognition Agreement. In this respect, the advice of the Management Committee should be relied upon. Fitters and workshops play an important role in the security of tachographs. It is therefore appropriate to lay down certain minimum requirements for their reliability and for approving and auditing them. Moreover, Member States should take appropriate measures to ensure that conflicts of interest between fitters or workshops and transport undertakings are prevented. Nothing in this Regulation prevents Member States from ensuring their approval, control and certification through the procedures laid down in Regulation (EC) No 765/2008 of the European Parliament and of the Council (7), provided that the minimum criteria set out in this Regulation are fulfilled. In order to ensure more effective scrutiny and control of driver cards, and to facilitate the tasks of control officers, national electronic registers should be established, and provision should be made for the interconnection of those registers. When checking the uniqueness of driver cards, Member States should use the procedures included in Commission Recommendation 2010/19/EU (8). Consideration should be given to the special situation in which a Member State should be able to provide a driver who does not have his normal residence in a Member State or in a country which is a contracting party to the European Agreement concerning the Work of Crews of Vehicles Engaged in International Road Transport of 1 July 1970 (‘the AETR Agreement’) with a temporary, non-renewable driver card. In such cases, the Member States concerned are to fully apply the relevant provisions of this Regulation. In addition, it should be possible for a Member State to issue driver cards to drivers resident on its territory even when the Treaties do not apply to certain parts thereof. In such cases, the Member States concerned are to fully apply the relevant provisions of this Regulation. Control officers face continuous challenges as a result of changes to the tachograph and new manipulation techniques. In order to ensure more effective control, and to enhance the harmonisation of control approaches throughout the Union, a common methodology should be adopted for the initial and continuing training of control officers. The recording of data by the tachograph, as well as developing technologies for the recording of position data, remote communication and the interface with ITS, will entail the processing of personal data. Therefore, the relevant Union rules, in particular those laid down in Directive 95/46/EC of the European Parliament and of the Council (9) and Directive 2002/58/EC of the European Parliament and of the Council (10), apply. In order to allow for fair competition in the development of applications related to the tachograph, intellectual property rights and patents related to the transmission of data in or out of the tachograph should be available to all on a royalty-free basis. Where applicable, the data exchanged during communication with the control authorities in the Member States should comply with relevant international standards, such as the suite of standards related to Dedicated Short-Range Communication established by the European Committee for Standardisation. To ensure fair competition in the internal road transport market and to send a clear signal to drivers and transport undertakings, Member States should impose, in compliance with the categories of infringements defined in Directive 2006/22/EC, effective, proportionate, dissuasive and non-discriminatory penalties, without prejudice to the principle of subsidiarity. Member States should ensure that the selection of vehicles for inspection is carried out without discrimination on grounds of the nationality of the driver, or of the country of registration or entry into service of the commercial vehicle. In the interests of the clear, effective, proportionate and uniform implementation of social rules in road transport, Member States’ authorities should apply the rules in a uniform manner. Each Member State should inform the Commission of any discoveries it makes regarding the availability of fraudulent devices or installations to manipulate the tachograph, including those offered through the internet, and the Commission should inform all other Member States of those discoveries. The Commission should continue to maintain its internet-based helpdesk, which allows drivers, transport undertakings, control authorities and approved fitters, workshops and vehicle manufacturers to submit questions and concerns related to the digital tachograph, including regarding new types of manipulations or fraud. Through the adaptations of the AETR Agreement, the use of the digital tachograph has been made mandatory as regards vehicles registered in third countries which are signatories to the AETR Agreement. As those countries are directly affected by changes to the tachograph introduced by this Regulation, they should be able to participate in a dialogue on technical matters, including regarding the system for the exchange of information on driver cards and workshop cards. A Tachograph Forum should therefore be set up. In order to ensure uniform conditions for the implementation of this Regulation, implementing powers should be conferred on the Commission relating to requirements, display and warning functions and type-approval of tachographs, as well as to detailed provisions for smart tachographs; the procedures to be followed for carrying out field tests and the forms to be used in order to monitor those field tests; the standard form for the written statement giving reasons for seal removal; the common procedures and specifications necessary for the interconnection of electronic registers; and the methodology specifying the content of the initial and continuing training of control officers. Those powers should be exercised in accordance with Regulation (EU) No 182/2011 of the European Parliament and of the Council (11). The implementing acts adopted for the purpose of this Regulation, which will replace the provisions in Annex I B to Regulation (EEC) No 3821/85 and other implementing measures, should be adopted by 2 March 2016. However, if for some reason those implementing acts have not been adopted in time, transitional measures should safeguard the necessary continuity. Implementing acts referred to in this Regulation should not be adopted by the Commission where the committee referred to in this Regulation delivers no opinion on the draft implementing act presented by the Commission. In the context of the application of the AETR Agreement, references to Regulation (EEC) No 3821/85 should be understood as references to this Regulation. The Union will consider the appropriate steps to be taken within the United Nations Economic Commission for Europe to ensure the necessary coherence between this Regulation and the AETR Agreement. The European Data Protection Supervisor was consulted in accordance with Article 28(2) of Regulation (EC) No 45/2001 of the European Parliament and of the Council (12) and delivered an opinion on 5 October 2011 (13). 1. This Regulation sets out obligations and requirements in relation to the construction, installation, use, testing and control of tachographs used in road transport, in order to verify compliance with Regulation (EC) No 561/2006, Directive 2002/15/EC of the European Parliament and of the Council (14) and Council Directive 92/6/EEC (15). Tachographs shall, as regards their construction, installation, use and testing, comply with the requirements of this Regulation. 2. This Regulation sets out the conditions and requirements under which the information and data, other than personal data, recorded, processed or stored by tachographs may be used for purposes other than the verification of compliance with the acts referred to in paragraph 1. 1. For the purposes of this Regulation, the definitions set out in Article 4 of Regulation (EC) No 561/2006 shall apply. ‘open standard’ means a standard set out in a standard specification document available freely or at a nominal charge which it is permissible to copy, distribute or use for no fee or for a nominal fee. 1. Tachographs shall be installed and used in vehicles registered in a Member State which are used for the carriage of passengers or goods by road and to which Regulation (EC) No 561/2006 applies. 2. Member States may exempt from the application of this Regulation the vehicles mentioned in Article 13(1) and (3) of Regulation (EC) No 561/2006. 3. Member States may exempt from the application of this Regulation vehicles used for transport operations which have been granted an exception in accordance with Article 14(1) of Regulation (EC) No 561/2006. Member States may exempt from the application of this Regulation vehicles used for transport operations which have been granted an exception in accordance with Article 14(2) of Regulation (EC) No 561/2006; they shall immediately notify the Commission thereof. 4. 15 years after newly registered vehicles are required to have a tachograph as provided in Articles 8, 9 and 10, vehicles operating in a Member State other than their Member State of registration shall be fitted with such a tachograph. 5. In the case of national transport operations, Member States may require the installation and use of tachographs in accordance with this Regulation in any of the vehicles for which their installation and use are not otherwise required by paragraph 1. 1. Tachographs, including external components, tachograph cards and record sheets shall fulfil stringent technical and other requirements such as to permit the proper implementation of this Regulation. 2. Tachographs and tachograph cards shall comply with the following requirements. 4. Analogue tachographs shall record at least the data referred to in points (a), (b) and (e) of paragraph 3.
the relevant transport undertaking so that it can comply with its legal obligations, in particular as set out in Articles 32 and 33. 6. The downloading of data shall be performed with the minimum of delay to transport undertakings or drivers. 7. Data recorded by the tachograph which may be transmitted in or out of the tachograph, whether wirelessly or electronically, shall be in the form of publicly available protocols as defined in open standards. 8. To ensure that tachographs and tachograph cards comply with the principles and requirements of this Regulation, and in particular of this Article, the Commission shall, by means of implementing acts, adopt detailed provisions necessary for the uniform application of this Article, in particular provisions which provide for the technical means of how to fulfil those requirements. Those implementing acts shall be adopted in accordance with the examination procedure referred to in Article 42(3). 9. The detailed provisions referred to in paragraph 8 shall, where appropriate, be based on standards and shall guarantee interoperability and compatibility between the various generations of vehicle units and all tachograph cards. 1. Information contained in digital tachographs and tachograph cards relating to vehicle activities and to drivers and co-drivers shall be displayed in a clear, unambiguous and ergonomic way. data related to menu access. Additional information may be displayed, provided that it is clearly distinguishable from the information required in this paragraph. 3. Digital tachographs shall warn drivers when detecting any event and/or fault, and before and at the time of exceeding the maximum allowed continuous driving time, in order to facilitate compliance with the relevant legislation. 4. Warnings shall be visual and may also be audible. Warnings shall have a duration of at least 30 seconds, unless they are acknowledged by the user by pushing any key of the tachograph. The reason for the warning shall be displayed and shall remain visible until acknowledged by the user using a specific key or command of the tachograph. 5. To ensure that tachographs comply with the requirements of this Article concerning display and warnings, the Commission shall, by means of implementing acts, adopt detailed provisions necessary for the uniform application of this Article. Those implementing acts shall be adopted in accordance with the examination procedure referred to in Article 42(3). 1. Member States shall ensure that the processing of personal data in the context of this Regulation is carried out solely for the purpose of verifying compliance with this Regulation and with Regulation (EC) No 561/2006, in accordance with Directives 95/46/EC and 2002/58/EC and under the supervision of the supervisory authority of the Member State referred to in Article 28 of Directive 95/46/EC. the keeping of records by transport undertakings as referred to in Article 33. 3. Digital tachographs shall be designed in such a way as to ensure privacy. Only data necessary for the purposes of this Regulation shall be processed. 4. Owners of vehicles, transport undertakings and any other entity concerned shall comply, where applicable, with the relevant provisions on the protection of personal data. the ending place of the daily working period. For that purpose, vehicles registered for the first time 36 months after the entry into force of the detailed provisions referred to in Article 11 shall be fitted with a tachograph connected to a positioning service based on a satellite navigation system. 2. As regards the connection of the tachograph to a positioning service based on a satellite navigation system, as referred to in paragraph 1, use shall be made only of service connections that exploit a positioning service free of charge. No position data other than those expressed, wherever possible, in geographical coordinates for determining the points referred to in paragraph 1, shall be permanently stored in the tachograph. Position data which need to be temporarily stored in order to allow for the automatic recording of the points referred to in paragraph 1 or to corroborate the motion sensor shall not be accessible to any user and shall automatically be deleted once they are no longer required for those purposes. 1. In order to facilitate targeted roadside checks by the competent control authorities, tachographs installed in vehicles registered for the first time 36 months after the entry into force of the detailed provisions referred to in Article 11 shall be able to communicate to those authorities while the vehicle is in motion. 2. 15 years after newly registered vehicles are required to have a tachograph as provided for in this Article and in Articles 8 and 10, Member States shall equip their control authorities to an appropriate extent with remote early detection equipment necessary to permit the data communication referred to in this Article, taking into account their specific enforcement requirements and strategies. Until that time, Member States may decide whether to equip their control authorities with such remote early detection equipment. 3. The communication referred to in paragraph 1 shall be established with the tachograph only when so requested by the equipment of the control authorities. It shall be secured to ensure data integrity and authentication of the recording and control equipment. Access to the data communicated shall be restricted to control authorities authorised to check infringements of Regulation (EC) No 561/2006 and of this Regulation and to workshops in so far as it is necessary to verify the correct functioning of the tachograph. speed recorded by the tachograph. 5. The data exchanged shall be used for the sole purpose of verifying compliance with this Regulation. They shall not be transmitted to entities other than authorities controlling driving and rest periods and to judicial bodies, in the framework of an ongoing judicial procedure. 6. The data may only be stored by the control authorities for the duration of a roadside check, and shall be deleted at the latest three hours after their communication, unless the data indicate a possible manipulation or misuse of the tachograph. If, in the course of the ensuing roadside check, the manipulation or misuse is not confirmed, the data transmitted shall be deleted. 7. Transport undertakings which operate vehicles shall be responsible for informing drivers of the possibility of remote communication for the purpose of early detection of possible manipulation or misuse of tachographs. 8. In no case shall a remote early detection communication of the type described in this Article lead to automatic fines or penalties for the driver or transport undertaking. The competent control authority, on the basis of the data exchanged, may decide to carry out a check on the vehicle and the tachograph. The result of the remote communication shall not prevent control authorities from carrying out random roadside checks based on the risk rating system introduced by Article 9 of Directive 2006/22/EC. the external device connected to the interface has access to personal data, including geopositioning data, only after the verifiable consent of the driver to whom the data relates. In order to ensure that smart tachographs comply with the principles and requirements set out in this Regulation, the Commission shall, by means of implementing acts, adopt detailed provisions necessary for the uniform application of Articles 8, 9 and 10, excluding any provisions which would provide for the recording of additional data by the tachograph. Those implementing acts shall be adopted in accordance with the examination procedure referred to in Article 42(3). specify the necessary standards for the interface referred to in Article 10. Such standards may include a provision on the distribution of access rights for drivers, workshops and transport undertakings, and control roles for the data recorded by the tachograph, which control roles shall be based on an authentication/authorisation mechanism defined for the interface, such as a certificate for each level of access and subject to the technical feasibility thereof. 1. Manufacturers or their agents shall submit an application for approval of a type of vehicle unit, motion sensor, model record sheet or tachograph card to the type-approval authorities designated to that effect by each Member State. 2. Member States shall communicate to the Commission by 2 March 2015 the name and contact details of the designated authorities referred to in paragraph 1, and shall provide updates thereafter as necessary. The Commission shall publish a list of designated type-approval authorities on its website and shall keep that list updated. 3. An application for type-approval shall be accompanied by the appropriate specifications, including necessary information regarding the seals, and by security, functionality and interoperability certificates. The security certificate shall be issued by a recognised certification body designated by the Commission. Functionality certificates shall be issued to the manufacturer by the type-approval authority. The interoperability certificate shall be issued by a single laboratory under the authority and responsibility of the Commission. the interoperability certificate shall certify that the tested item is fully interoperable with the necessary tachographs or tachograph card models. 5. Any modification in software or hardware of the tachograph or in the nature of materials used for its manufacture shall, before being applied, be notified to the authority which granted type-approval for the equipment. That authority shall confirm to the manufacturer the extension of the type-approval, or may require an update or a confirmation of the relevant functional, security and/or interoperability certificates. 6. No application in respect of any one type of vehicle unit, motion sensor, model record sheet or tachograph card may be submitted to more than one Member State. 7. The Commission shall, by means of implementing acts, adopt detailed provisions for the uniform application of this Article. Those implementing acts shall be adopted in accordance with the examination procedure referred to in Article 42(3). A Member State shall grant type-approval to any type of vehicle unit, motion sensor, model record sheet or tachograph card which complies with the requirements set out in Articles 4 and 11, provided that the Member State is in a position to check that production models conform to the approved type. Any modifications or additions to an approved model must receive additional type-approval from the Member State which granted the original type-approval. Member States shall issue to the applicant a type-approval mark conforming to a pre-established model, for each type of vehicle unit, motion sensor, model record sheet or tachograph card which they approve pursuant to Article 13 and Annex II. Such models shall be adopted by the Commission through implementing acts in accordance with the examination procedure referred to in Article 42(3). The competent authorities of the Member State to which the application for type-approval has been submitted shall, in respect of each type of vehicle unit, motion sensor, model record sheet or tachograph card which they approve, send within one month a copy of the type-approval certificate accompanied by copies of the relevant specifications, including those relating to the seals, to the authorities of the other Member States. Where the competent authorities do not approve the application for type-approval, they shall notify the authorities of the other Member States that approval has been refused and shall communicate the reasons for their decision. 1. If a Member State which has granted type-approval as provided for in Article 13 finds that any vehicle units, motion sensors, record sheets or tachograph cards bearing the type-approval mark issued by it do not conform to the type which it has approved, it shall take the necessary measures to ensure that production models conform to the approved type. The measures taken may, if necessary, extend to withdrawal of type-approval. 2. A Member State which has granted type-approval shall withdraw such approval if the vehicle unit, motion sensor, record sheet or tachograph card which has been approved is not in conformity with this Regulation or if it displays any general defect during use which makes it unsuitable for the purpose for which it is intended. 3. If a Member State which has granted type-approval is notified by another Member State of one of the cases referred to in paragraphs 1 or 2, it shall, after consulting the notifying Member State, take the steps laid down in those paragraphs, subject to paragraph 5. 4. A Member State which ascertains that one of the cases referred to in paragraph 2 has arisen may forbid until further notice the placing on the market and putting into service of the vehicle unit, motion sensor, record sheet or tachograph card concerned. The same applies in the cases referred to in paragraph 1 with respect to vehicle units, motion sensors, record sheets or tachograph cards which have been exempted from EU initial verification, if the manufacturer, after due warning, does not bring the equipment into line with the approved model or with the requirements of this Regulation. In any event, the competent authorities of the Member States shall within one month notify one another and the Commission of any withdrawal of type-approval or of any other measures taken pursuant to paragraphs 1, 2 or 3, and shall specify the reasons for such action. 5. If a Member State which has granted a type-approval disputes the existence of any of the cases specified in paragraphs 1 or 2 notified to it, the Member States concerned shall endeavour to settle the dispute and the Commission shall be kept informed. If talks between the Member States have not resulted in agreement within four months of the date of the notification referred to in paragraph 3, the Commission, after consulting experts from all Member States and having considered all the relevant factors, such as economic and technical factors, shall within six months of the expiry of that four-month period adopt a decision which shall be notified to the Member States concerned and communicated at the same time to the other Member States. The Commission shall in each case lay down the time-limit for implementation of its decision. 1. An applicant for type-approval of a model record sheet shall state on the application form the type or types of analogue tachograph on which the record sheet in question is designed to be used, and shall provide suitable equipment of such type or types for the purpose of testing the record sheet. 2. The competent authorities of each Member State shall indicate on the approval certificate for the model record sheet the type or types of analogue tachograph on which that model record sheet may be used. All decisions pursuant to this Regulation refusing or withdrawing approval of a type of vehicle unit, motion sensor, model record sheet or tachograph card shall specify in detail the reasons on which they are based. A decision shall be communicated to the party concerned, who shall at the same time be informed of the remedies available under the law of the relevant Member State and of the time-limits for the exercise of such remedies. Member States shall not refuse to register any vehicle fitted with a tachograph, or prohibit the entry into service or use of such vehicle for any reason connected with the fact that the vehicle is fitted with such equipment, if the equipment bears the type-approval mark referred to in Article 14 and the installation plaque referred to in Article 22(4). 1. Manufacturers shall design, test and review vehicle units, motion sensors and tachograph cards put into production so as to detect vulnerabilities arising in all phases of the product life-cycle, and shall prevent or mitigate their possible exploitation. The frequency of tests shall be laid down by the Member State which granted the approval certificate, within a limit which shall not exceed two years. 2. For this purpose, manufacturers shall submit the documentation necessary for vulnerability analysis to the certification body referred to in Article 12(3). 3. For the purposes of paragraph 1, the certification body referred in Article 12(3) shall conduct tests on vehicle units, motion sensors and tachograph cards to confirm that known vulnerabilities cannot be exploited by individuals in possession of publicly available knowledge. 4. If, in the course of the tests referred to in paragraph 1, vulnerabilities in system elements (vehicle units, motion sensors and tachograph cards) are detected, those elements shall not be put on the market. If vulnerabilities are detected in the course of the tests referred to in paragraph 3 for elements already on the market, the manufacturer or the certification body shall inform the competent authorities of the Member State which granted the type-approval. Those competent authorities shall take all measures necessary to ensure that the problem is addressed, in particular by the manufacturer, and shall inform the Commission without delay of the vulnerabilities detected and of the measures envisaged or taken, including where necessary the withdrawal of type-approval in accordance with Article 16(2). 1. Member States may authorise field tests of tachographs which have not yet been type-approved. Member States shall mutually recognise such authorisations for field tests. 2. Drivers and transport undertakings participating in a field test shall comply with the requirements of Regulation (EC) No 561/2006. In order to demonstrate such compliance, drivers shall follow the procedure set out in Article 35(2) of this Regulation. 3. The Commission may adopt implementing acts to lay down the procedures to be followed for carrying out field tests and the forms to be used in order to monitor those field tests. Those implementing acts shall be adopted in accordance with the examination procedure referred to in Article 42(3). 1. Tachographs may be installed or repaired only by fitters, workshops or vehicle manufacturers approved by the competent authorities of the Member States for that purpose in accordance with Article 24. 2. Approved fitters, workshops or vehicle manufacturers shall, in accordance with the specifications included in the type-approval certificate referred to in Article 15, seal the tachograph after having verified that it is functioning properly, and, in particular, in such a way as to ensure that no manipulation device can tamper with or alter the data recorded. 3. The approved fitter, workshop or vehicle manufacturer shall place a special mark on the seals which it affixes and, in addition, for digital tachographs, shall enter the electronic security data for carrying out authentication checks. The competent authorities of each Member State shall send to the Commission the register of the marks and electronic security data used and the necessary information related to the electronic security data used. The Commission shall give Member States access to that information upon request. 4. For the purpose of certifying that the installation of the tachograph took place in accordance with the requirements of this Regulation, an installation plaque shall be affixed in such a way as to be clearly visible and easily accessible. 5. Tachograph components shall be sealed as specified in the type-approval certificate. Any connections to the tachograph which are potentially vulnerable to tampering, including the connection between the motion sensor and the gearbox, and the installation plaque where relevant, shall be sealed. for the purpose of vehicle repair or modification which affects the seal. In such cases, a written statement stating the date and time at which the seal was broken and giving the reasons for the seal removal shall be kept on board the vehicle. The Commission shall develop a standard form for the written statement through implementing acts. In all cases, the seals shall be replaced by an approved fitter or workshop without undue delay and at the latest within seven days of their removal. Before replacing seals, a check and calibration of the tachograph shall be performed by an approved workshop. 1. Tachographs shall be subject to regular inspection by approved workshops. Regular inspections shall be carried out at least every two years. the tyre size and the actual circumference of the tyres. 3. Workshops shall draw up an inspection report in cases where irregularities in the functioning of the tachograph had to be remedied, whether as a result of a periodic inspection or of an inspection carried out at the specific request of the national competent authority. They shall keep a list of all inspection reports drawn up. 4. Inspection reports shall be retained for a minimum period of two years from the time the report was made. Member States shall decide whether inspection reports are to be retained or sent to the competent authority during that period. In cases where the inspection reports are kept by the workshop, upon request from the competent authority, the workshop shall make available the reports of inspections and calibrations carried out during that period. 1. Member States shall approve, regularly control and certify the fitters, workshops and vehicle manufacturers which may carry out installations, checks, inspections and repairs of tachographs. the fitters, workshops and vehicle manufacturers are of good repute. unannounced technical audits of approved fitters or workshops shall also take place in order to check the calibrations, inspections and installations carried out. Those audits shall cover at least 10 % of the approved fitters and workshops annually. 4. Member States and their competent authorities shall take appropriate measures to prevent conflicts of interests between fitters or workshops and transport undertakings. In particular, where there is a serious risk of a conflict of interests, additional specific measures shall be taken to ensure that the fitter or workshop complies with this Regulation. 5. The competent authorities of the Member States shall forward to the Commission, if possible electronically, on an annual basis, the lists of approved fitters and workshops and the cards issued to them. The Commission shall publish those lists on its website. 6. The competent authorities in Member States shall withdraw approvals, either temporarily or permanently, from fitters, workshops and vehicle manufacturers which fail to meet their obligations under this Regulation. 1. The period of validity of workshop cards shall not exceed one year. When renewing the workshop card, the competent authority shall ensure that the criteria listed in Article 24(2) are met by the fitter, workshop or vehicle manufacturer. 2. The competent authority shall renew a workshop card within 15 working days after receipt of a valid renewal request and all the necessary documentation. If a workshop card is damaged, malfunctions, or is lost or stolen, the competent authority shall supply a replacement card within five working days of receiving a detailed request to that effect. Competent authorities shall maintain a register of lost, stolen or defective cards. 3. If a Member State withdraws the approval of a fitter, workshop or vehicle manufacturer as provided for in Article 24, it shall also withdraw the workshop cards issued thereto. 4. Member States shall take all necessary measures to prevent the workshop cards distributed to approved fitters, workshops and vehicle manufacturers from being falsified. 1. Driver cards shall be issued, at the request of the driver, by the competent authority of the Member State where the driver has his normal residence. They shall be issued within one month of the receipt by the competent authority of the request and all necessary documentation. 2. For the purposes of this Article, ‘normal residence’ means the place where a person usually lives, that is for at least 185 days in each calendar year, because of personal and occupational ties, or, in the case of a person with no occupational ties, because of personal ties which show close links between that person and the place where he is living. However, the normal residence of a person whose occupational ties are in a place different from their personal ties and who consequently lives in turn in different places situated in two or more Member States shall be regarded as being the place of their personal ties, provided that such person returns there regularly. This last condition need not be complied with where the person is living in a Member State in order to carry out a fixed-term assignment. 3. Drivers shall give proof of their normal residence by any appropriate means, such as their identity card or any other valid document. Where the competent authorities of the Member State issuing the driver card have doubts as to the validity of a statement as to normal residence, or for the purpose of certain specific controls, they may request any additional information or evidence. 4. In duly justified and exceptional cases, Member States may issue a temporary and non-renewable driver card valid for a maximum period of 185 days to a driver who does not have his normal residence in a Member State or in a State which is a Contracting Party to the AETR Agreement, provided that such driver is in a labour law relationship with an undertaking established in the issuing Member State and, in so far as Regulation (EC) No 1072/2009 of the European Parliament and of the Council (16) applies, presents a driver attestation as referred to in that Regulation. The Commission shall, on the basis of data provided by Member States, closely monitor the application of this paragraph. It shall report its findings every two years to the European Parliament and to the Council, and shall examine in particular whether temporary driver cards produce any negative impact on the labour market, and whether temporary cards are issued to named drivers ordinarily on more than one occasion. The Commission may make an appropriate legislative proposal to revise this paragraph. 5. The competent authorities of the issuing Member State shall take appropriate measures to ensure that an applicant does not already hold a valid driver card and shall personalise the driver card, ensuring that its data are visible and secure. 6. The driver card shall not be valid for more than five years. 7. A valid driver card shall not be withdrawn or suspended unless the competent authorities of a Member State find that the card has been falsified, or the driver is using a card of which he is not the holder, or the card held has been obtained on the basis of false declarations and/or forged documents. If such suspension or withdrawal measures are taken by a Member State other than the issuing Member State, the former shall return the card to the authorities of the Member State which issued it, as soon as possible, indicating the reasons for the withdrawal or suspension. If the return of the card is expected to take longer than two weeks, the suspending or withdrawing Member State shall inform the issuing Member State within those two weeks of the reasons for suspension or withdrawal. 8. Member States shall take all necessary measures to prevent driver cards from being falsified. 9. This Article shall not prevent a Member State from issuing a driver card to a driver who has his normal residence in a part of that Member State’s territory, to which the Treaty on European Union and the Treaty on the Functioning of the European Union do not apply, provided that the relevant provisions of this Regulation are applied in such cases. 1. The driver card is personal. 2. A driver may hold no more than one valid driver card, and is only authorised to use his own personalised driver card. A driver shall not use a driver card which is defective or which has expired. 1. Where a driver wishes to renew his driver card, he shall apply to the competent authorities of the Member State of his normal residence not later than 15 working days before the expiry date of the card. 2. Where, in the case of renewals, the Member State of the driver’s normal residence is different from that which issued his current card, and where the authorities of the former Member State are requested to renew the driver card, they shall inform the authorities which issued the earlier card of the reasons for its renewal. 3. In the event of a request for the renewal of a card which is imminently about to expire, the competent authority shall supply a new card before the expiry date, provided that the request was sent within the time-limits laid down in paragraph 1. 1. Issuing authorities shall keep records of issued, stolen, lost or defective driver cards for a period at least equivalent to their period of validity. 2. If a driver card is damaged or if it malfunctions, the driver shall return it to the competent authority of the Member State of his normal residence. Theft of the driver card shall be formally declared to the competent authorities of the State where the theft occurred. 3. Any loss of the driver card shall be reported in a formal declaration to the competent authorities of the issuing Member State and to the competent authorities of the Member State of the driver’s normal residence if this is different. 4. If the driver card is damaged, malfunctions or is lost or stolen, the driver shall, within seven calendar days, apply for its replacement to the competent authorities of the Member State of his normal residence. Those authorities shall supply a replacement card within eight working days after their receipt of a detailed request to that effect. 5. In the circumstances set out in paragraph 4, the driver may continue to drive without a driver card for a maximum period of 15 calendar days or for a longer period if this is necessary for the vehicle to return to the premises where it is based, provided that the driver can prove the impossibility of producing or using the card during that period. 1. Driver cards issued by Member States shall be mutually recognised. 2. Where the holder of a valid driver card issued by a Member State has established his normal residence in another Member State, he may ask for his card to be exchanged for an equivalent driver card. It shall be the responsibility of the Member State which carries out the exchange to verify whether the card produced is still valid. 3. Member States carrying out an exchange shall return the old card to the authorities of the issuing Member State and indicate the reasons for so doing. 4. Where a Member State replaces or exchanges a driver card, the replacement or exchange, and any subsequent replacement or exchange, shall be registered in that Member State. 2. The Commission and the Member States shall take all necessary measures to ensure that the electronic registers are interconnected and accessible throughout the Union, using the TACHOnet messaging system referred to in Recommendation 2010/19/EU or a compatible system. In the case of the use of a compatible system, the exchange of electronic data with all other Member States shall be possible through the TACHOnet messaging system. 3. When issuing, replacing and, where necessary, renewing a driver card, Member States shall verify through electronic data exchange that the driver does not already hold another valid driver card. The data exchanged shall be limited to the data necessary for the purpose of this verification. 4. Control officers may have access to the electronic register in order to check the status of a driver card. 5. The Commission shall adopt implementing acts to lay down the common procedures and specifications necessary for the interconnection referred to in paragraph 2, including the format for the data exchanged, the technical procedures for electronic consultation of the national electronic registers, access procedures and security mechanisms. Those implementing acts shall be adopted in accordance with the examination procedure referred to in Article 42(3). 1. Transport undertakings and drivers shall ensure the correct functioning and proper use of digital tachographs and driver cards. Transport undertakings and drivers using analogue tachographs shall ensure their correct functioning and the proper use of record sheets. 2. Digital tachographs shall not be set in such a way that they automatically switch to a specific category of activity when the vehicle’s engine or ignition is switched off, unless the driver remains able to choose manually the appropriate category of activity. 3. It shall be forbidden to falsify, conceal, suppress or destroy data recorded on the record sheet or stored in the tachograph or on the driver card, or print-outs from the tachograph. Any manipulation of the tachograph, record sheet or driver card which could result in data and/or printed information being falsified, suppressed or destroyed shall also be prohibited. No device which could be used to this effect shall be present on the vehicle. 4. Vehicles shall not be fitted with more than one tachograph, except for the purposes of the field tests referred to in Article 21. 5. Member States shall forbid the production, distribution, advertising and/or selling of devices constructed and/or intended for the manipulation of tachographs. 1. Transport undertakings shall be responsible for ensuring that their drivers are properly trained and instructed as regards the correct functioning of tachographs, whether digital or analogue, shall make regular checks to ensure that their drivers make correct use thereof, and shall not give to their drivers any direct or indirect incentives that could encourage the misuse of tachographs. Transport undertakings shall issue a sufficient number of record sheets to drivers of vehicles fitted with analogue tachographs, taking into account the fact that record sheets are personal in character, the length of the period of service and the possible need to replace record sheets which are damaged or have been taken by an authorised control officer. Transport undertakings shall issue to drivers only record sheets of an approved model suitable for use in the equipment installed in the vehicle. Where a vehicle is fitted with a digital tachograph, the transport undertaking and the driver shall ensure that, taking into account the length of the period of service, the printing of data from the tachograph at the request of a control officer can be carried out correctly in the event of an inspection. 2. Transport undertakings shall keep record sheets and printouts, whenever printouts have been made to comply with Article 35, in chronological order and in a legible form, for at least a year after their use, and shall give copies to the drivers concerned who request them. Transport undertakings shall also give copies of data downloaded from driver cards to the drivers concerned who request them, together with printed paper versions of those copies. Record sheets, printouts and downloaded data shall be produced or handed over at the request of any authorised control officer. 3. Transport undertakings shall be liable for infringements of this Regulation committed by their drivers or by drivers at their disposal. However, Member States may make such liability conditional on the transport undertaking’s infringement of the first subparagraph of paragraph 1 of this Article and Article 10(1) and (2) of Regulation (EC) No 561/2006. 1. Drivers shall use record sheets or driver cards every day on which they are driving, starting from the moment they take over the vehicle. The record sheet or driver card shall not be withdrawn before the end of the daily working period unless its withdrawal is otherwise authorised. No record sheet or driver card may be used to cover a period longer than that for which it is intended. 2. Drivers shall adequately protect the record sheets or driver cards, and shall not use dirty or damaged record sheets or driver cards. if the vehicle is fitted with a digital tachograph, be entered onto the driver card using the manual entry facility provided for in the tachograph. Member States shall not impose on drivers a requirement to present forms attesting to their activities while away from the vehicle. 4. Where there is more than one driver on board a vehicle fitted with a digital tachograph, each driver shall ensure that his driver card is inserted into the correct slot in the tachograph. Where there is more than one driver on board a vehicle fitted with an analogue tachograph, the drivers shall amend the record sheets as necessary, so that the relevant information is recorded on the record sheet of the driver who is actually driving. the time of any change of vehicle. 7. The driver shall enter in the digital tachograph the symbols of the countries in which the daily working period started and finished. However, a Member State may require drivers of vehicles engaged in transport operations inside its territory to add more detailed geographic specifications to the country symbol, provided that the Member State notified those detailed geographic specifications to the Commission before 1 April 1998. It shall not be necessary for drivers to enter the information referred to in the first sentence of the first subparagraph if the tachograph is automatically recording location data in accordance with Article 8. 1. In the event of damage to a record sheet bearing recordings or to a driver card, drivers shall keep the damaged record sheet or driver card together with any spare record sheet used to replace it. at the end of the journey, print out the information relating to periods of time recorded by the tachograph, record any periods of other work, availability and rest taken since the printout made at the start of the journey, where not recorded by the tachograph, and mark on that document details enabling the driver to be identified (name, driver card or driving licence number), including the driver’s signature. any manual records and printouts made during the current day and the previous 28 days as required under this Regulation and Regulation (EC) No 561/2006. the record sheets corresponding to the same period as that referred to in point (ii) during which he drove a vehicle fitted with an analogue tachograph. 3. An authorised control officer may check compliance with Regulation (EC) No 561/2006 by analysis of the record sheets, of the displayed, printed or downloaded data which have been recorded by the tachograph or by the driver card or, failing that, of any other supporting document that justifies non-compliance with a provision, such as Articles 29(2) and 37(2) of this Regulation. 1. In the event of the breakdown or faulty operation of a tachograph, the transport undertaking shall have it repaired by an approved fitter or workshop, as soon as circumstances permit. If the vehicle is unable to return to the transport undertaking’s premises within a period of one week calculated from the day of the breakdown or of the discovery of defective operation, the repair shall be carried out en route. Measures taken by Member States pursuant to Article 41 shall give the competent authorities power to prohibit the use of the vehicle in cases where the breakdown or faulty operation has not been remedied as provided in the first and the second subparagraphs of this paragraph in so far as this is in accordance with the national legislation in the Member State concerned. on a temporary sheet to be attached to the record sheet or to be kept together with the driver card. the tools necessary to download data files from vehicle units and tachograph cards and to be able to analyse such data files and printouts from digital tachographs in combination with record sheets or charts from analogue tachographs. records and stores data correctly, and that the calibration parameters are correct. 3. Control officers shall be empowered to request authorised workshops to perform the tests referred to in paragraph 2 and specific tests designed to detect the presence of manipulation devices. If manipulation devices are detected, the equipment, including the device itself, the vehicle unit or its components, and the driver card, may be removed from the vehicle and may be used as evidence in accordance with national rules of procedure relating to the handling of such evidence. 4. Control officers shall, where appropriate, make use of the possibility to check tachographs and driver cards which are on site during a check of the premises of undertakings. 1. Member States shall ensure that control officers are appropriately trained for the analysis of the data recorded and the checking of tachographs in order to achieve efficient and harmonised control and enforcement. 2. Member States shall inform the Commission of the training requirements for their control officers by 2 September 2016. 3. The Commission shall, by means of implementing acts, adopt measures specifying the content of the initial and continuing training of control officers, including training in relation to techniques to target controls and to detect manipulation devices and fraud. Those measures shall include guidelines to facilitate the implementation of the relevant provisions of this Regulation and of Regulation (EC) No 561/2006. Those implementing acts shall be adopted in accordance with the examination procedure referred to in Article 42(3). 4. Member States shall include the content specified by the Commission in the training given to control officers. Member States shall assist each other in applying this Regulation and in checking compliance therewith. Within the framework of that mutual assistance, the competent authorities of the Member States shall, in particular, regularly send to each other all available information concerning infringements of this Regulation by fitters and workshops, types of manipulation practices, and any penalties imposed for such infringements. 1. Member States shall, in accordance with national constitutional arrangements, lay down rules on penalties applicable to infringements of this Regulation and shall take all measures necessary to ensure that they are implemented. Those penalties shall be effective, proportionate, dissuasive and non-discriminatory, and shall be in compliance with the categories of infringements set out in Directive 2006/22/EC. 2. The Member States shall notify the Commission of those measures and the rules on penalties by 2 March 2016. They shall inform the Commission of any subsequent change to those measures. Where the opinion of the committee is to be obtained by a written procedure, that procedure shall be terminated without result when, within the time-limit for delivery of the opinion, the chair of the committee so decides or a simple majority of committee members so request. 1. A Tachograph Forum shall be set up in order to support dialogue on technical matters concerning tachographs among Member States’ experts, members of the committee referred to in Article 42, and experts from third countries which are using the tachograph under the AETR Agreement. 2. Member States should delegate as experts to the Tachograph Forum the experts participating in the committee referred to in Article 42. 3. The Tachograph Forum shall be open to participation by experts from interested third countries which are Contracting Parties to the AETR Agreement. 4. Stakeholders, representatives of vehicle manufacturers, tachograph manufacturers, social partners and the European Data Protection Supervisor shall be invited to the Tachograph Forum. 5. The Tachograph Forum shall adopt its rules of procedure. 6. The Tachograph Forum shall meet at least once a year. Member States shall communicate to the Commission the text of the laws, regulations and administrative provisions which they adopt in the field governed by this Regulation no later than 30 days after their date of adoption and for the first time by 2 March 2015.
vehicles or combinations of vehicles with a maximum permissible mass not exceeding 7,5 tonnes used by universal service providers as defined in Article 2(13) of Directive 97/67/EC of the European Parliament and of the Council of 15 December 1997 on common rules for the development of the internal market of Community postal services and the improvement of quality of service (17) to deliver items as part of the universal service. In so far as the implementing acts referred to in this Regulation have not been adopted so that they may be applied at the time of application of this Regulation, the provisions in Regulation (EEC) No 3821/85, including in Annex IB thereto, shall continue to apply, on a transitional basis, until the date of application of the implementing acts referred to in this Regulation. Regulation (EEC) No 3821/85 is hereby repealed. References to the repealed Regulation shall be construed as references to this Regulation. It shall, subject to the transitional measures in Article 46, apply with effect from 2 March 2016. However, Articles 24, 34 and 45 shall apply with effect from 2 March 2015. Done at Strasbourg, 4 February 2014. (1) OJ C 43, 15.2.2012, p. 79. (2) Position of the European Parliament of 3 July 2012 (OJ C 349 E, 29.11.2013, p. 105) and position of the Council at first reading of 15 November 2013 (OJ C 360, 10.12.2013, p. 66). Position of the European Parliament of 15 January 2014 (not yet published in the Official Journal). (3) Council Regulation (EEC) No 3821/85 of 20 December 1985 on recording equipment in road transport (OJ L 370, 31.12.1985, p. 8). (4) Regulation (EC) No 561/2006 of the European Parliament and of the Council of 15 March 2006 on the harmonisation of certain social legislation relating to road transport and amending Council Regulations (EEC) No 3821/85 and (EC) No 2135/98 and repealing Council Regulation (EEC) No 3820/85 (OJ L 102, 11.4.2006, p. 1). (7) Regulation No (EC) 765/2008 of the European and of the Council of 9 July 2008 setting out the requirements for accreditation and market surveillance relating to the marketing of products and repealing Regulation (EEC) No 339/93 (OJ L 218, 13.8.2008, p. 30). (8) Commission Recommendation 2010/19/EU of 13 January 2010 on the secure exchange of electronic data between Member States to check the uniqueness of driver cards that they issue (OJ L 9, 14.1.2010, p. 10). (12) Regulation (EC) No 45/2001 of the European Parliament and of the Council of 18 December 2000 on the protection of individuals with regard to the processing of personal data by the Community institutions and bodies and on the free movement of such data (OJ L 8, 12.1.2001, p. 1). (13) OJ C 37, 10.2.2012, p. 6. (14) Directive 2002/15/EC of the European Parliament and of the Council of 11 March 2002 on the organisation of the working time of persons performing mobile road transport activities (OJ L 80, 23.3.2002, p. 35). (15) Council Directive 92/6/EEC of 10 February 1992 on the installation and use of speed limitation devices for certain categories of motor vehicles in the Community (OJ L 57, 2.3.1992, p. 27). (16) Regulation (EC) No 1072/2009 of the European Parliament and of the Council of 21 October 2009 on common rules for access to the international road haulage market (OJ L 300, 14.11.2009, p. 72). (17) OJ L 15, 21.1.1998, p. 14.’. the average of the distances travelled by the several wheels moving the vehicle (driving wheels) in the course of one complete rotation. The measurement of these distances must take place under normal test conditions (see point 4 of Part VI of this Annex) and is expressed in the form: 1 = … mm. for electronic recording equipment which is equipment operating by signals transmitted electrically from the distance and speed sensor, any interruption exceeding 100 milliseconds in the power supply of the recording equipment (except lighting), in the power supply of the distance and speed sensor and any interruption in the signal lead to the distance and speed sensor. For vehicles used by two drivers, the equipment must be capable of recording simultaneously but distinctly and on two separate record sheets details of the periods listed under points 3, 4 and 5 of the first paragraph. one or more time recorders satisfying the requirements laid down in point (c)(4). for electronic recording equipment, as defined in point 7 of the first paragraph of Part II, any interruption exceeding 100 milliseconds in the power supply of the distance and speed sensor and any interruption in the signal lead to the distance and speed sensor. Any inclusion in the equipment of devices additional to those listed in point 1 must not interfere with the proper operation of the mandatory devices or with the reading of them. All the constituent parts of the recording equipment must be made of materials with sufficient stability and mechanical strength and stable electrical and magnetic characteristics. Any modification in a constituent part of the equipment or in the nature of the materials used for its manufacture must, before being applied in manufacture, be submitted for approval to the authority which granted type-approval for the equipment. The range of speed measurement shall be as stated in the type-approval certificate. The natural frequency and the damping of the measuring device must be such that the instruments showing and recording the speed can, within the range of measurement, follow acceleration changes of up to 2 m/s2, within the limits of accepted tolerances. The control of the mechanism for resetting the clock must be located inside a case containing the record sheet; each opening of that case must be automatically recorded on the record sheet. If the forward movement mechanism of the record sheet is controlled by the clock, the period during which the latter will run correctly after being fully wound must be greater by at least 10 % than the recording period corresponding to the maximum sheet-load of the equipment. The visual instruments of the equipment must be provided with adequate non-dazzling lighting. For normal conditions of use, all the internal parts of the equipment must be protected against damp and dust. In addition, they must be made proof against tampering by means of casings capable of being sealed. The value of the smallest grading on the instrument showing distance travelled must be 0,1 kilometres. Figures showing hectometres must be clearly distinguishable from those showing whole kilometres. The figures on the distance recorder must be clearly legible and must have an apparent height of at least 4 mm. The distance recorder must be capable of reading up to at least 99 999,9 kilometres. Within the range of measurement, the speed scale must be uniformly graduated by 1, 2, 5 or 10 kilometres per hour. The value of a speed graduation (space between two successive marks) must not exceed 10 % of the maximum speed shown on the scale. The range indicated beyond that measured need not be marked by figures. The length of each space on the scale representing a speed difference of 10 kilometres per hour must not be less than 10 millimetres. On an indicator with a needle, the distance between the needle and the instrument face must not exceed three millimetres. The time indicator must be visible from outside the equipment and must give a clear, plain and unambiguous reading. All equipment, whatever the form of the record sheet (strip or disc), must be provided with a mark enabling the record sheet to be inserted correctly, in such a way as to ensure that the time shown by the clock and the time-marking on the record sheet correspond. The mechanism moving the record sheet must be such as to ensure that the latter moves without play and can be freely inserted and removed. For record sheets in disc form, the forward movement device must be controlled by the clock mechanism. In this case, the rotating movement of the record sheet must be continuous and uniform, with a minimum speed of seven millimetres per hour measured at the inner border of the ring marking the edge of the speed recording area. In equipment of the strip type, where the forward movement device of the record sheets is controlled by the clock mechanism, the speed of rectilinear forward movement must be at least 10 millimetres per hour. Recording of the distance travelled, of the speed of the vehicle and of any opening of the case containing the record sheet or sheets must be automatic. Every kilometre of distance travelled must be represented on the record by a variation of at least one millimetre on the corresponding coordinate. Even at speeds reaching the upper limit of the range of measurement, the record of distances must still be clearly legible. the markings on the time-scale must cross the recording area in a curve of the same radius as the trace drawn by the stylus. The spaces between the markings on the time-scale must represent a period not exceeding one hour. Each variation in speed of 10 kilometres per hour must be represented on the record by a variation of at least 1,5 millimetres on the corresponding coordinate. Recording equipment must be so constructed that the period of driving time is always recorded automatically and that it is possible, through the operation where necessary of a switch device, to record separately the other periods of time as indicated in points (ii), (iii) and (iv) of Article 34(5)(b) of this Regulation. It must be possible, from the characteristics of the traces, their relative positions and if necessary the signs laid down in Article 34 of this Regulation, to distinguish clearly between the various periods of time. The various periods of time should be differentiated from one another on the record by differences in the thickness of the relevant traces, or by any other system of at least equal effectiveness from the point of view of legibility and ease of interpretation of the record. In the case of vehicles with a crew consisting of more than one driver, the recordings provided for in point 4.1 must be made on separate record sheets, each record sheet being allocated to one driver. In this case, the forward movement of the separate record sheets must be effected either by a single mechanism or by separate synchronised mechanisms. The case containing the record sheet or sheets and the control of the mechanism for resetting the clock must be fitted with a lock. Each opening of the case containing the record sheet or sheets and the control of the mechanism for resetting the clock must be automatically recorded on the record sheet or sheets. the measurement range of the speedometer, in the form ‘Vmin … km/h, Vmax … km/h’. This marking is not necessary if it is shown on the descriptive plaque of the equipment. where α is the angle measured from the horizontal position of the front face (fitted the right way up) of the equipment for which the instrument is calibrated, while β and γ represent respectively the maximum permissible upward and downward deviations from the angle of calibration α. The maximum tolerances set out in points 1, 2 and 3 are valid for temperatures between 0 °C and 40 °C, temperatures being taken in close proximity to the equipment. Measurement of the maximum tolerances set out in points 2 and 3 shall take place under the conditions laid down in Part VI. The record sheets must be such that they do not impede the normal functioning of the instrument and that the records which they contain are indelible and easily legible and identifiable. In addition it must be possible to write on the record sheets, without damaging them and without affecting the legibility of the recordings, the information referred to in Article 34 of this Regulation. The minimum recording capacity of the record sheets, whatever their form, must be 24 hours. one or more areas for data relating to driving time, to other periods of work and availability, to breaks from work and to rest periods for drivers. The area for recording speed must be scaled off in divisions of 20 kilometres per hour or less. The speed corresponding to each marking on the scale must be shown in figures against that marking. The symbol ‘km/h’ must be shown at least once within the area. The last marking on the scale must coincide with the upper limit of the range of measurement. The area for recording distance travelled must be set out in such a way that the number of kilometres travelled may be read without difficulty. The area or areas reserved for recording the periods referred to in point 1 must be so marked that it is possible to distinguish clearly between the various periods of time. upper limit of the speed measurement range, printed in kilometres per hour. By way of minimal additional requirements, each record sheet must bear, in printed form, a time-scale graduated in such a way that the time may be read directly at intervals of fifteen minutes while each five-minute interval may be determined without difficulty. the time at which any change of vehicle takes place. 1. Recording equipment must be positioned in the vehicle in such a way that the driver has a clear view from his seat of the speedometer, distance recorder and clock while at the same time all parts of those instruments, including driving parts, are protected against accidental damage. 2. It must be possible to adapt the constant of the recording equipment to the characteristic coefficient of the vehicle by means of a suitable device, to be known as an adaptor. Vehicles with two or more rear axle ratios must be fitted with a switch device whereby those various ratios may be automatically brought into line with the ratio for which the equipment has been adapted to the vehicle. 3. After the equipment has been checked on installation, an installation plaque must be affixed to the vehicle beside the equipment or in the equipment itself and in such a way as to be clearly visible. After every inspection by an approved fitter or workshop requiring a change in the setting of the installation itself, a new installation plaque must be affixed in place of the previous one. the dates on which the characteristic coefficient of the vehicle was determined and the effective circumference of the wheel tyres was measured. any cover giving access to the means of adapting the constant of the recording equipment to the characteristic coefficient of the vehicle. In particular cases, further seals may be required on approval of the equipment type and a note of the positioning of those seals must be made on the approval certificate. provided that the recording equipment continues to function reliably and correctly and is resealed by an approved fitter or workshop immediately after fitting the speed limitation device or any other device contributing to road safety or within seven days in other cases. For each occasion that those seals are broken, a written statement giving the reasons for such action must be prepared and made available to the competent authority. 5. The cables connecting the recording equipment to the transmitter must be protected by a continuous plastic-coated rust-protected steel sheath with crimped ends, except where an equivalent protection against manipulation is guaranteed by other means (for example by electronic monitoring such as signal encryption) capable of detecting the presence of any device which is unnecessary for the correct operation of the recording equipment and the purpose of which is to prevent the accurate operation of the recording equipment by short circuiting or interruption or by modification of the electronic data from the speed and distance sensor. A joint, comprised of sealed connections, is deemed to be continuous within the meaning of this Regulation. The aforementioned electronic monitoring may be replaced by an electronic control which ensures that the recording equipment is able to record any movement of the vehicle, independent from the signal of the speed and distance sensor. For the purposes of the application of this point, M 1 and N 1 vehicles are those defined in Part A of Annex II to Directive 2007/46/EC of the European Parliament and of the Council (1). For those vehicles that are equipped with tachographs in compliance with this Regulation and are not designed to be fitted with an armoured cable between the distance and speed sensors and the recording equipment, an adaptor shall be fitted as close as possible to the distance and speed sensors. The armoured cable shall be fitted from the adaptor to the recording equipment. Every individual device, whether new or repaired, shall be certified in respect of its correct operation and the accuracy of its readings and recordings, within the limits laid down in point (f)(1) of Part III, by means of sealing in accordance with point (f) of the first paragraph of point 4 of Part V.
For this purpose, the Member States may stipulate an initial verification, consisting of a check on, and confirmation of, the conformity of a new or repaired device with the type-approved model and/or with the requirements of this Regulation, or may delegate the power to certify to the manufacturers or to their authorised agents. When being fitted to a vehicle, the equipment and the whole installation must comply with the provisions relating to maximum tolerances laid down in point (f)(2) of Part III. The inspection tests shall be carried out by the approved fitter or workshop on its own responsibility. Periodic inspections of the equipment fitted to vehicles shall take place at least every two years and may be carried out in conjunction with roadworthiness tests of vehicles. the actual circumference of the tyres. An inspection to ensure compliance with point (f)(3) of Part III on the maximum tolerances in use shall be carried out at least once every six years, although each Member State may stipulate a shorter inspection interval for vehicles registered in its territory. Such inspections must include replacement of the installation plaque. movement of the vehicle: the vehicle must proceed, driven by its own engine, in a straight line and on a level surface, at a speed of 50 ± 5 km/h. Provided that it is of comparable accuracy, the test may also be carried out on an appropriate test bench. (1) Directive 2007/46/EC of the European Parliament and of the Council of 5 September 2007 establishing a framework for the approval of motor vehicles and their trailers, and of systems, components and separate technical units intended for such vehicles (OJ L 263, 9.10.2007, p. 1). an approval number corresponding to the number of the approval certificate drawn up for the prototype of the recording equipment or the record sheet or to the number of a tachograph card, placed at any point within the immediate proximity of that rectangle. The approval mark shall be shown on the descriptive plaque of each set of equipment and on each record sheet and on each tachograph card. It must be indelible and must always remain clearly legible. 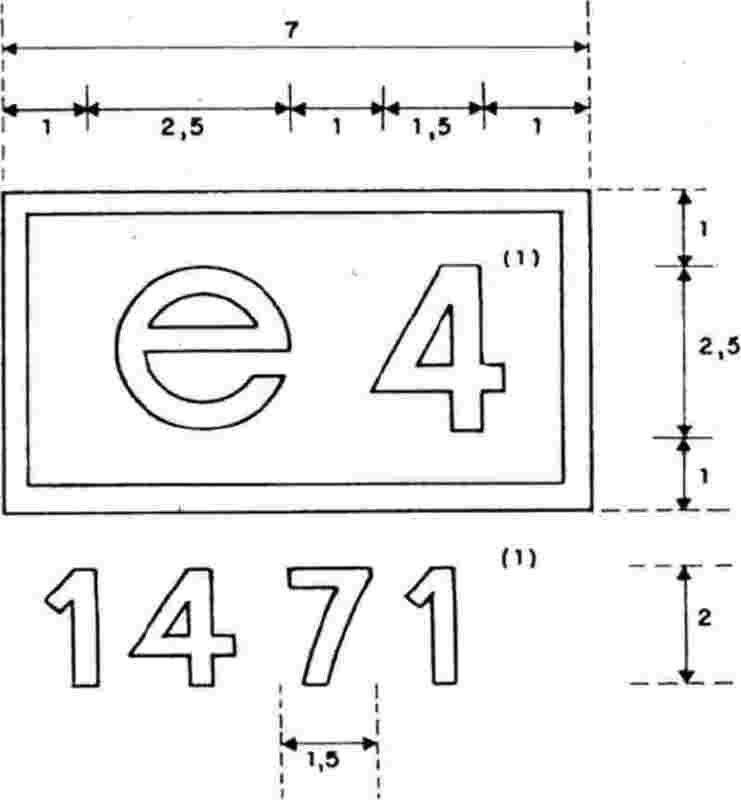 The dimensions of the approval mark drawn below (1) are expressed in millimetres, these dimensions being minima. The ratios between the dimensions must be maintained. A Member State which has granted approval shall issue the applicant with an approval certificate, the model of which is given below. When informing other Member States of approvals issued or, if the occasion should arise, withdrawn, a Member State shall use copies of that certificate. (1) These figures are shown for guidance only. (2) Delete items not applicable. (3) Tick the relevant boxes. (4) Specify the component dealt with in the notification.